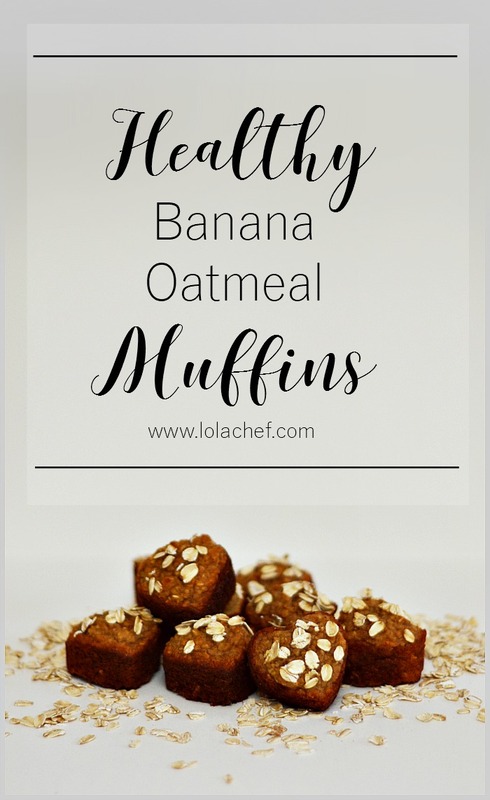 I love oatmeal and bananas together and who doesn’t love a good muffin? Would you believe that these muffins are flourless and have honey instead of sugar? 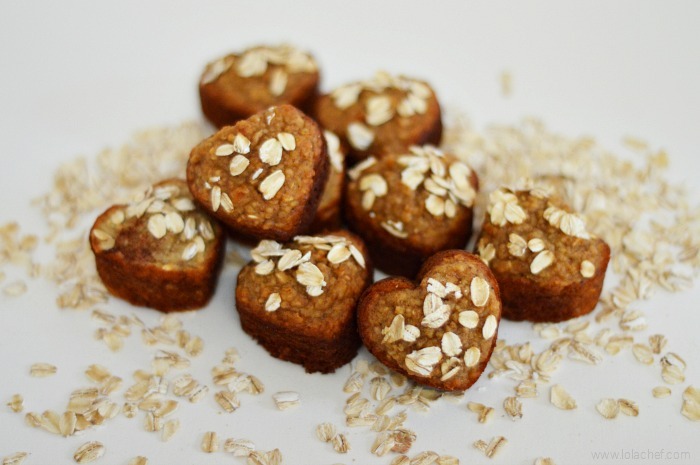 Yes, these are actually healthy oatmeal banana muffins. This was one of those recipes where I threw in things I had handy around the house and…… it worked! These muffins came out moist and tasted great. I basically wanted to make it out of fruit and oatmeal without flour or white sugar. I had a whole bunch of bananas that were way too ripe. I had only one apple left, and a few pears. I took out some oatmeal and decided to grind it up and use it as the flour. I started with three cups because I wanted to use up so many bananas I had to increase gradually to five cups. The batter was way too runny. I didn’t want to use granulated sugar so I blended up the apple and pear and placed in my mixer bowl. Then I added 1 cup of honey. I didn’t feel bad about using so much honey because it has antioxidants right?!? I blended that then added vanilla and eggs like a typical recipe. Lastly, I added all the oatmeal until it was the right consistency. I used the Ninja Master Prep Professional (QB1004) small food processor which blended the fruit right down in less than a minute. It also did a fabulous job grinding up the oats. In a lot of baking recipes, you would blend sugar and butter or oil, then add eggs and alternate some milk/liquid and flour. I blended the fruit and honey together, this created enough of a liquid that it just needs eggs to help bind and hold together and some blended oats as flour. At this point, it didn’t look appetizing at all. I filled up the heart shaped cupcake pan and placed in the oven and crossed my fingers. This was an experimental recipe and ……. to my surprise! they came out good enough for my kids to eat them. Did I mention that my son has severe allergies, is picky and has a mouth device? He needs healthy soft foods, this was perfect. In a food processor grind oatmeal place in a medium bowl and add salt and baking powder, set aside. Slice apple and pears into small pieces, and place in food processor and blend well. Place in mixing bowl. Add bananas and 1 cup of honey and blend. Add vanilla and eggs, blend well. Add ground oatmeal mixture and blend till incorporated well. If mixture is too watery you can add more oatmeal. It should resemble thick pancake batter. Grease a cupcake pan with non-stick spray. Fill each section 1/2 full. Add raw oatmeal oats to the top and place in preheated oven for 15-20 minutes. I blended bananas, apples, and pears until they resembled baby food. Make sure you grease the pan well, I used non-stick cooking spray between each batch. When each batch was cooled I removed from the pan, wiped the pan down and added more spray. This made it easy for me to take the muffins out of the pan and was easy to clean. This makes about 4 dozen small muffins. It may seem like a lot and you can play around to make less. I like making a lot, they are great with a cup of coffee. They also are easy to grab if you skip breakfast or your kids need a quick snack. Muffins can be stored at room temperature in an airtight container for about a week. These look so yummy! I am definitely going to make some of these! My kids don’t eat bananas so it will mean I will have to eat them all but that’s fine with me!